Simple QED: A quantum state without electron energy levels? PITTSBURGH - March 5, 2018 - PRLog -- . In 2014, a mysterious 3.5 keV X-ray emission from the Perseus galaxy was found  that could not be explained by standard X-ray wavelengths of atomic elements as depicted in the thumbnail. Subsequently, the 3.5 keV signal was found in 73 other galaxies suggesting uniformity of the signal throughout the cosmos. Since the X-ray signal is not present in the known X-ray emission lines of the elements, a dark matter explanation based on sterile neutrinos that upon decay emitted the mysterious X-ray line. As of 2016, there was no consensus opinion on the physics behind 3.5 keV signal. Of relevance to this PR, charge exchange of bare sulfur atoms stripped of all electrons in the heat of the hot galaxy medium was found [2,3] to produce the 3.5 keV X-ray line. To simulate Perseus heating, the bare sulfur atoms were prepared by heating CS2 with an electron beam to a minimum energy of 3494 eV. Electrons in atoms make transitions in electron energy levels by emitting photons with an energy exactly equal to the difference between the two energy levels. But X-ray lines at 3.5 keV do not appear in X-ray emission of atomic elements. What this means is the 3.5 keV X-ray is emitted by a quantum state independent of electron energy levels. 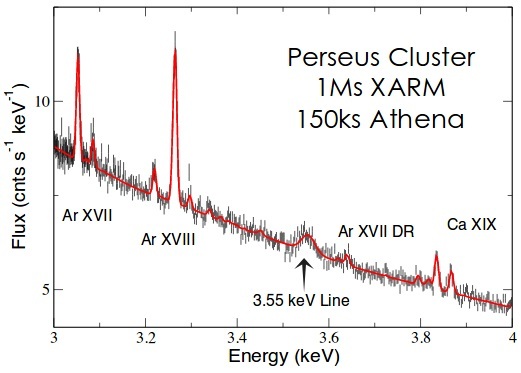 The 3.5 keV X-rays found in Perseus are produced by simple QED, but not the complex theory of Feynman. Simple QED is a consequence of QM that by the Planck law requires the heat capacity of NPs to vanish under high EM confinement. QM stands for quantum mechanics, NPs for nanoparticles, and EM for electromagnetic. Since QM denies atoms heat capacity, the heat does not increase NP temperature. But NPs have high S/V ratios that require heat to almost entirely reside in the NP surface. S/V stands for surface-to-volume. Precluded from thermal expansion, the surface heat places internal NP atoms under the high EM confinement necessary by the Planck law for the heat capacity of the atom to vanish. Without an 3.5 keV electron energy level, the simple QED transition from the ground state to 3.5 keV is created by using up the heat in the NP surface depending only on the dimensions of the NP that define the energy of the photon standing within the EM confinement. Provided the heat is deposited promptly, say < 150 fs, energy conservation proceeds by creating a non-thermal photon inside the NP having half-wavelength λ/2 = d, where d is the dimension of the NP diameter. The Planck energy E of the standing photon is, E = hν = h(c/n)/λ = hc/2nd, where c is the speed of light and the refractive index n correcting for the lower speed in the NP. Lower frequency UV-VIS states of the NP including plasmon resonances are excited from simple QED by florescence and in the absence of lower NP states the photon is directly emitted to the surroundings. For applications of vanishing heat capacity by the Planck law. See: http://www.nanoqed.org/, 2010 – 2018. Simple QED was formulated for NPs > 10 nm having EUV energy levels - not atoms < 1 nm in the X-ray range. In the extension to 3.5 keV X-rays, cosmic dust NPs in Perseus are required to fragment to bare atoms upon heating in the hot galaxy medium. Thermal vaporization does not occur as QM precludes high temperatures. Instead, the heat produces EM radiation that ionizes the NPs inducing Coulomb repulsion that by fragmentation progressively creates smaller and smaller clusters until atoms alone are formed. Depending on the atom diameter, the heat by simple QED raises the energy level of the atoms at which time the 3.5 keV X-ray is emitted. Applying simple QED to the 3.5 keV X-ray emission from Perseus and taking E = 3.55 keV from the thumbnail gives the wavelength λ = hc/E = 0.349 nm. The atom diameter d = λ/2n, but at X-ray frequencies, n = 1 and d = λ/2 = 174.5 pm with radius 87.25 pm. Of the atomic elements, krypton and sulfur have radius = 88 pm. Krypton aside, simple QED emission is analogous to the charge exchange experiment [2,3] for bare sulfur atoms with the heat provided by the hot Perseus medium instead of Earth based electron beams. Collisions with H atoms are not required. The line broadening of the 3.55 keV line is caused by small variations in the dimensions d of the fragmented sulfur atom. Simple QED energy levels differ from conventional QM levels based on electron energy levels by dependence on the size of the NP or atom. H. Bulbul, et al. "Detection of Unidentified Emission Linein the Stacked X-ray Spectrum of Galaxy Clusters,"ApJ, 789, 13, 2014. A.Gu, et al. "A Novel scenariao for the possible X-ray line feature at 3.5 keV : Charge eschange with bare sulfur ions," A&A, 584, L11, 2015. C. Shah, et al., "Laboratory Measurements Compellingly Support Charge-Exchange Mechanism For The 'Dark Matter' – 3.5 Kev X-Ray Line", arXiv:1608.04751v1 [astro-ph.HE] 16 Aug 2016.